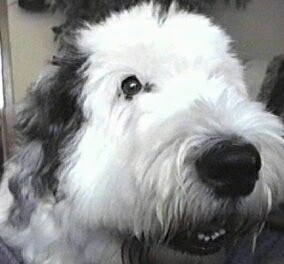 The Old English Sheepdog is a strong, compact, square dog. The topline is lower at the shoulders, sloping higher toward the back end. The chest is deep and broad. The head is large with a well-defined stop. The nose is black. The teeth meet in a level or tight scissors bite. Eyes come in brown, blue or one of each color. The medium sized ears are carried flat to the head. The front legs are very straight and the hind legs are round and muscular. The small feet point straight ahead and are round with well-arched toes. 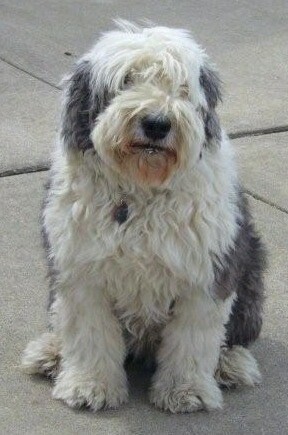 The Old English Sheepdog is either born tailless (as the name Bobtail implies) or is completely amputated. Note: it is illegal to dock tails in most parts of Europe. The shaggy, double coat is long and profuse with a good, hard, textured outer coat and a soft, waterproof undercoat. Coat colors include gray, grizzle, blue, blue gray, blue merle, gray with white markings or white with gray markings. 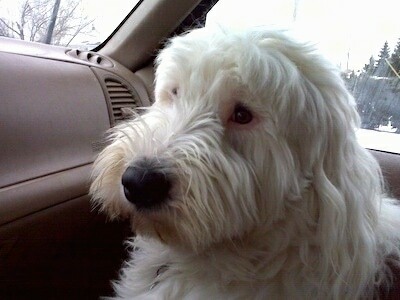 The Old English Sheepdog is stable and happy-go-lucky. It is able to adjust oneself readily to different conditions, is loving and friendly. Loyal, protective and intelligent, it makes a fine family companion. Friendly and gentle, this breed loves and is good with children and is very much part of the family. They have a strong herding instinct and may try to herd people by bumping, not nipping, and need to be taught not to herd humans. Meek or passive owners or those that do not make the rules of the home clear in a way the dog can understand will cause the dog to become strong-willed. This breed needs firm, but calm, confident and consistent leadership. The Old English Sheepdog is a very good worker and is able to follow commands, but will ignore the instruction if it thinks it is stronger minded than its human pack members. 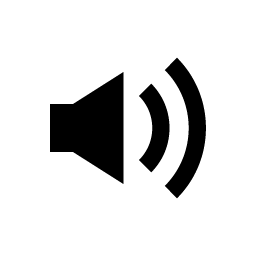 The bark of the Old English Sheepdog sounds like a cracked bell. This breed remains puppy-like for many years, and age tends to hit it suddenly. Prone to IMHA (Immune Mediated Hemolytic Anemia), hip dysplasia and cataracts. Some herding dogs carry a MDR1 gene which makes them sensitive to certain drugs that are otherwise okay to give another dog, but if tested positive for this gene can kill them. The Old English Sheepdog will do okay in an apartment if it is sufficiently exercised. These dogs are fairly active indoors and will do best with at least an average-sized yard. These dogs were developed for hard work and love a good run. They need to be taken on a daily walk, jog or run. While out on the walk the dog must be made to heel beside or behind the person holding the lead, as in a dog's mind the leader leads the way, and that leader needs to be the human. The coarse, longhaired coat needs constant care to keep it in top condition. Unless it is combed and brushed right through to the dense, waterproof undercoat at least three times per week, it will become matted and the dog may develop skin problems, making it prone to host parasites. Clip out any tangles carefully so as not to nick the skin. A grooming table will make the whole job easier. If the dog is not being shown, the coat can be professionally machine-clipped every two months or so, about one inch all the way around. In former times these dogs were shorn along with sheep. Trim around the eyes and rear-end with blunt-nosed scissors. This breed sheds like a human—not a lot, but in small amounts. 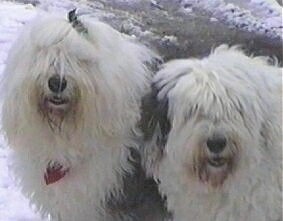 There are a few theories about the origin of the Old English Sheepdog. One is that it is related to the Poodle and the Deerhound. Other theories are it is related to the Briard and the Bergamasco, or from Scotch Bearded Collies and the Russian Owtchar, a hairy Russian breed brought to Great Britain on ships from the Baltic. The Old English Sheepdog was developed in the western counties of England by farmers who needed a quick, well-coordinated sheep herder and cattle driver to take their animals to market. The dogs became widely used in agricultural areas. Farmers began the practice of docking the tails in the 18th century as a way of identifying the dogs that were used for working so they could get a tax exemption. For this reason the dogs were given the nickname "Bobtail." Each spring, when the sheep were sheared, farmers would also shear the dogs’ coats to make warm clothing and blankets. 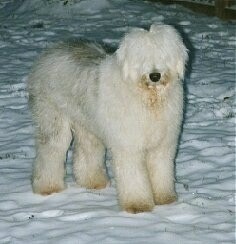 The Old English Sheepdog has been used for reindeer herding because it tolerates cold weather so well. It was first shown in Britain in 1873 and by the AKC in 1888. Some of the Old English Sheepdog's talents include: retrieving, herding and watchdog. 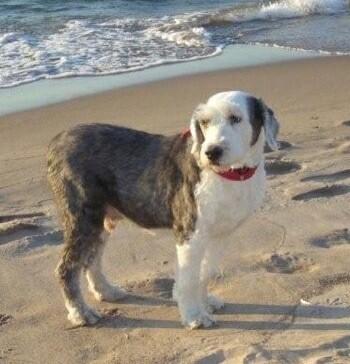 "Toby is an Old English Sheepdog, shown here at about 9.5 years old. He is extremely intelligent, smart and obedient. He is the love of my life. In this picture Toby has full-length hair." "This is Toby with his hair cut short due to a vacation time in Union Pier, MI." This is Sir Winston Maxwell 7th. Born: May 1, 1997. See more photos of Max and his sister Abby! 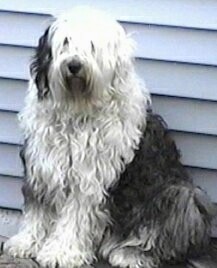 "This is my Old English Sheepdog Selina. The pictures were taken at a friend’s goat farm when she was 9 month sold, where Selina "attempted" to herd the goats. She is a silly girl, and has two speeds, sleeping and bouncing! She always has a smile on and is everyone’s friend. She absolutely loves the water, drinking it, sticking her paws in it, swimming in it and drinking while swimming. I do agility with her and it’s one of her favorite things to do. I have a Border Collie as well, and call her my dog, and Selina my big bear. I watch Cesar Millan; I have his first season on DVD and have read his first book. He taught me to be a pack leader. I have used his techniques to raise my first dog, and Selina as well. I am the pack leader, and know that this makes my dogs better k-9s." 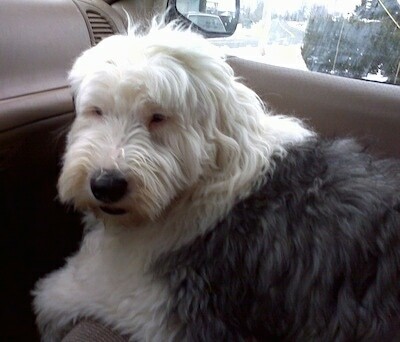 "This is my Old English Sheepdog (Bobtail) named Barry at about 5 years old. He is the smartest and the most intelligent dog in the world. I spend as much time has I can with my buddy. He loves going for car rides and walks with me. Barry is very special in my life and I love him with all my heart."